WHAT LIES BENEATH There may be a 20-kilometer-wide lake hidden under Mars' southern polar ice sheets, shown here in images from NASA’s Mars Orbiter Camera on the Mars Global Surveyor spacecraft. 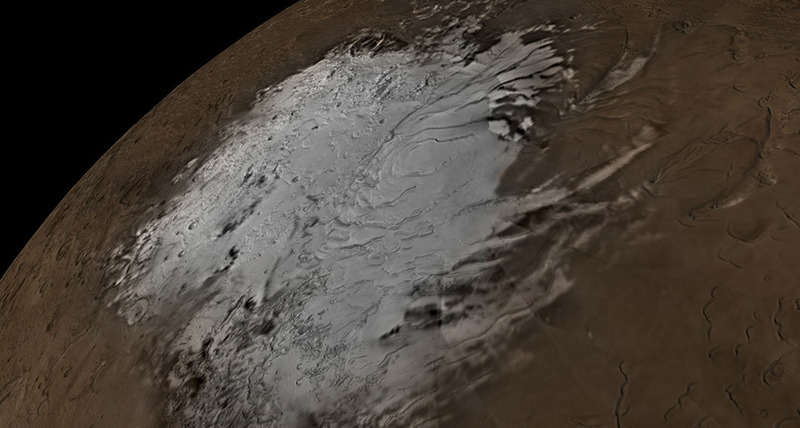 A Mars orbiter has detected a wide lake of liquid water hidden below the planet is southern ice sheets. There have been much-debated hints of tiny, ephemeral amounts of water on Mars before. But if confirmed, this lake marks the first discovery of a long-lasting cache of the liquid. The lake is about 20 kilometers across, planetary scientist Roberto Orosei of the National Institute of Astrophysics in Bologna, Italy and his colleagues report online July 25 in Science - but the water is buried beneath 1.5 kilometers of solid ice.